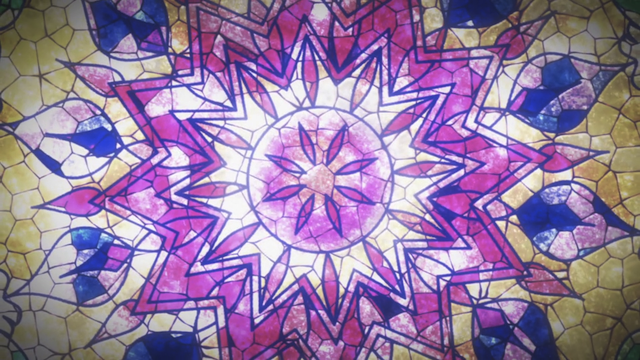 This post is my final “first impression” post of the Fall 2012 anime season, I swear! I was thinking I could get away with just two “first impression” posts this season, but it turns out this season has enough going on that the omnibus format is still quite useful. This week I include Zetsuen no Tempest for the first time. I also have juggled my pseudo-ranking scheme a little bit; shows that were previously marked “dropped” are still off the list, but some shows have failed to impress me during the first 2-3 episodes. I’m breaking this list up, then, into shows that have shown themselves to be Solid, those that I am still Following, and those that are on Probation. 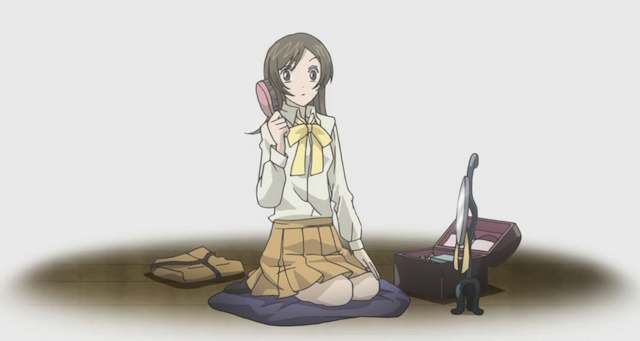 Nanami wearing her school uniform (the blazer is folded on the ground beside her). (AKA Kamisama Kiss) I already posted about episode 3 this week. This show continues to include interesting artwork as well as slowly developing its strange vision of the future. (AKA From the New World) This is the sort of show that takes a while to come together, because the setting is so ambitious, but now the story is starting to take off, and a lot of the explanation of the world they live in has provided — certainly not enough to make complete sense, but enough for the audience to perceive threats to the main characters. In the earliest episodes the show was mostly developing a creepy atmosphere that was detectable around the edges of the protective bubble the children lived in. By the end of episode 4, the kids are finally in a situation that requires resolution. 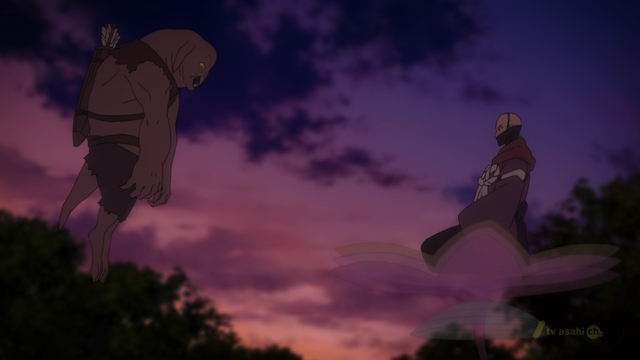 A Buddhist monk, levitating on a lotus flower, fights a demon. I also like the way the show has jumbled ancient religious mythology and Science Fiction. Very well done! With only two episodes, this show is still just getting off the ground, but I’m glad they spent the episode on the events after inspector Tsunemori’s shooting of the “hunting dog”, enforcer Kougami. The episode gave us an opportunity to feel the awkwardness of the situation, and also to see that even non-lethal use of the dominator gun is a very serious thing. 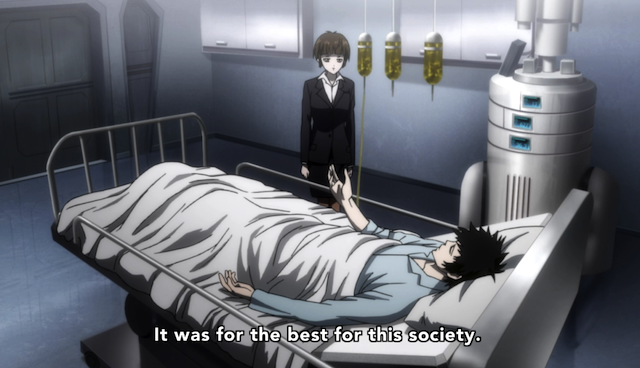 I was also pleased by Kougami’s comment, “you were ale to put justice before your duty”. That is a great summation of what I was thinking at the end of the first episode. 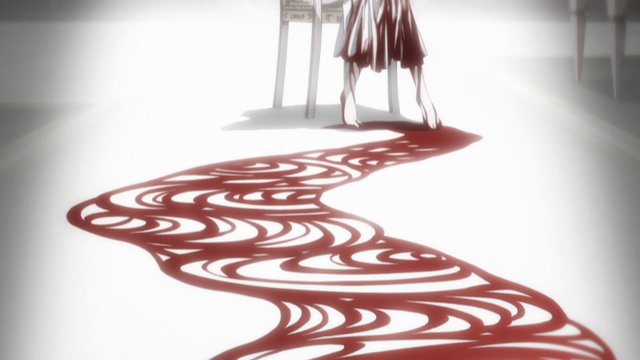 An artistic sense that isn’t afraid to be highly stylized is evident in the pattern of the blood. I hadn’t planned to watch this show, but I checked it out, since some people were saying such good things about it. It actually is quite good. Every episode has been solid, and the action sequences are well animated. The show does a good job of grounding the fantasy elements, by giving them requirements, and thus they can be used strategically. The pretty interesting, being a bit enigmatic, and having a non-standard reason for saving the world. These shows have good qualities. Though they may not be amongst my faves for this season, I am having a good time watching them. I haven’t seen any new episodes of these shows yet this week, so I won’t bother elaborating further. These titles are on Probation for one reason or another. Chuu-ni-byou has DEFINITELY become a harem rom-com. Normally that would cause it to drop like a rock, but I do like the production qualities, and the show has been pretty amusing. Nevertheless, I am worried about it. Tonari no Kaibutsu-kun went on probation last week, and I haven’t seen another episode of it yet. I’ll re-evaluate when I get a chance to see episode 3. 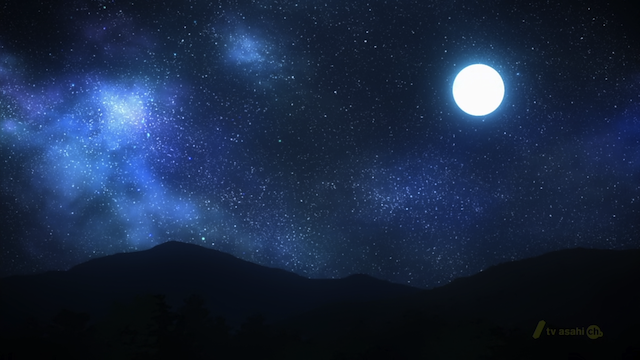 Robotics;Notes has been disappointing so far. The second episode had some good points about putting the robot together, but the main character was a real drag. I guess that will change at some point, but his constant whining about having to do ANYTHING was frustrating to watch. One of the great things about Okarin (from Steins;Gate) was his boundless enthusiasm. Here we have the anti-Okarin. The dude doesn’t want to do anything other than play his robot fighting game, and then, when presented with the opportunity to battle real robots he he whines that it would be too much trouble. Not a bad week of anime viewing. I saw some very good episodes, and a couple that dismayed me. This season has a lot of series that I am interested in keeping up with, so I can’t possibly blog them all. I haven’t decided what the best approach will be, so it will have to be a surprise. Later! I’d recommend keeping Tonari on Kaibutsu-kun on probation. The relationship/situations in the show make no sense and is just ridiculous. Brains Base should have chosen something better to adapt. I have to say that usually Brains Base seems to have good taste in picking source material, so I’m a bit surprised that the story isn’t more impressive. Admittedly, it is still early in the season. Oh, I just realized that I actually did watch a third episode of this show. Meh. I’ll have to think about it later (too hungry to think). Yeah, I only have a limited amount of time I can spend watching anime, and there’s so much stuff coming out now (even just on Crunchyroll, my main vein) that I’m actually watching LESS just because I can’t decide on which ones to follow. What a predicament!!!!! There certainly are worse predicaments. 😀 I usually try to catch up on something that I missed the first time around, but I just don’t see how I’ll be able to do it this season. Yeah I was just talking to someone that I met at an anime meetup in my region who sported a 93% watch rate for this season. I have to admit I could not afford to do that time wise so I have to applaud his ambition. Though it really is only time constraints keeping me back. I have to admit, if I had all the time in the world I would probably even watch the bad ones. 93% — That’s crazy. Well if they can keep that up, more power to ’em. I definitely watch even bad ones at times, since sometimes I want to kick back and watch cartoons, and that is all that is left. On the other hand, I sometimes use those opportunities to rewatch classics, and that can be quite rewarding. Yeah, it turned out to be a good show. I’m not sure why, but when I watched the preview it never seemed particularly interesting. I guess the description would sound pretty generic (two boys and a magical princess try to save the world), but the execution here is very good. I’m liking “Zetsuen no Tempest” a lot so far. I like the way they’re laying down ground rules for the magic. (I also like how our sorceress’ wardrobe gets a little more ragged every episode. I wonder how far that’ll go?) My one concern is that the show seems to be set up for one very obvious downer twist at the end. Hope I’m reading the situation wrong. I would say it is off to a good start. I’m certainly looking forward to seeing how they develop the idea from here.